As magmas ascend from depth towards the surface they undergo decompression and cooling, the former being responsible for the release of dissolved volatiles in the form of volcanic gases; all three factors induce crystals to form. The speed at which magma travels towards the surface affects the rate of crystallisation, and as such, the study of the textures of explosively erupted lavas can reveal quantitative information about magmatic ascent rates and crystallisation history. Muir and co-workers from the University of Bristol present a novel method of analysing lava microtextures. They harness a powerful new technique (EDS element mapping) whereby a rock sample is bombarded with electrons. Sample interaction with electrons produces a variety of emissions, some of which are X-rays with wavelengths characteristic to the elemental composition of the target. The combination of different elements translates into an energy spectrum which is analysed to determine the abundance of specific elements. This is repeated many thousands of times over a small area to build up a ‘map’ for each element, where the intensity of colour is proportional to the elemental concentration. Individual mineral phases can be identified and isolated; calculations are then performed to obtain the relative proportions, sizes and distributions of glass, minerals and bubbles. 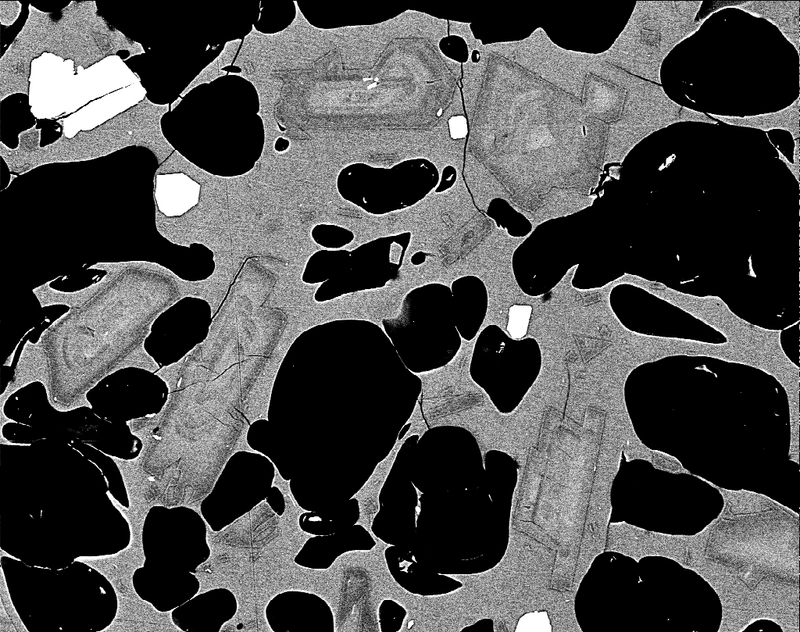 Aluminium element map of a lava sample erupted from the Mt St Helens Dome on 29th Mar 1984. The image, taken with an electron microscope, reveals zoning in plagioclase crystals. The technique of EDS element mapping is applied to lavas from Mt St Helens erupted bewteen 1980 – 1986. The observed trends in microtextures are similar to those previously published, with groundmass crystallinity displaying a sharp increase after the catastrophic eruption in the summer of 1980, before increasing more gradually during the next dome-building phase of activity. EDS element mapping presents significant advantages over the previous method of manually extracting data from greyscale backscattered electron images through faster data processing, reduction in operator time and accurate identification of all textural components. 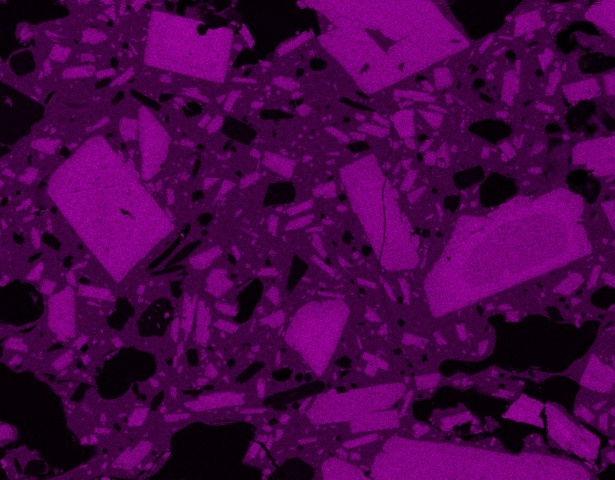 The authors also highlight the potential for coupling of this technique with developing technologies, such as field emission gun (FEG) sources, which would radically reduce acquisition time and enable better spatial resolution at small crystal sizes. Microscopic imaging of erupted lavas reveals such rocks comprise a mix of glass (rapidly quenched molten rock), bubbles (originally filled with gases), and crystals. The arrangement of these components is described as the rock’s ‘texture’ and is highly variable between different eruptions and volcanoes. Lavas from explosive eruptions, where lava is rapidly erupted to the surface, are dominated by bubbles; in contrast, slowly extruded samples have time to crystallise tiny minerals (microphenocrysts) and degas dissolved volatiles. 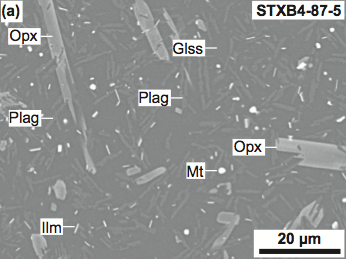 Melnik and co-workers used crystal size distributions (CSD), a way of analysing crystal size and ’roundness’, as a method of quantifying volcanic texture. The study determined the relationship between the volume fraction of crystals in a sample, and parameters such as the cross-sectional area of the volcanic conduit and crystal nucleation rate. CSD can therefore be used as a measure of how magma travels through the sub-volcanic system at different depths and to track the ascent of molten rock to the surface. The model is applied to a lava sample from the 1980 eruption of Mt St Helens volcano, USA. High resolution imaging allows the study of small (<10 µm) crystals and extends the depth range of the calculations to ~8 km, which agree with other estimates from seismic imaging and petrologic studies. Not only does the new model of Melnik et al. pave the way for more advanced understanding of how lava ascend through volcanic conduits, it also allows estimation of discharge rate and conduit geometry for prehistoric or unmonitored eruptions.